There was very little documentation found with the two collections (which were originally thought to be from a single source): There was a story, a letter and a collection of strange index cards. The story was told by Dr. Robert Pearce, who was the Museum’s Director at the time: "The collection was a trade made between the Museum's founder, Wilfrid Jury, and an archaeologist in London, England." The letter was from W.F. Grimes (an archaeologist from London, UK) and indicated the collection had been excavated from a WWII bomb crater at Salters’ Hall near Walbrook in London. The letter was dated 13 March, 1950. The index cards said things like 'from royal cemetery,' 'Larsa period', and 'one more'. What could these tell us about the collection? The letter supported the story, but the index cards did not fit at all. The dated letter helped to locate a London Free Press article from 13 March, 1950 discussing the arrival of “Roman Relics” in the city. 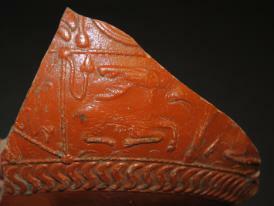 1900-YEAR-OLD POTTERY RELICS FROM U.K. GIVEN TO U.W.O. MUSEUM." In order to make sense of all these disjointed clues we had to start asking the right questions. Question #1 - Who was W.F. Grimes? W.F. Grimes was a Welsh archaeologist and a professor of Archaeology at the University of London. In 1947 he began leading excavations for the Roman and Medieval London Excavation Council within the city of London, England. Extensive bombing campaigns on the city during the Second World War left large craters throughout the city. These craters exposed evidence of the Roman city of Londinium and medieval London. In 1950, while he was associated with the Guildhall Museum, he and Wilfrid Jury made an exchange of artefacts. Stone tools and examples of pottery were sent from Jury to England, and a sample of Roman artefacts were sent to Canada. Question #2 - Why do some of the artefacts not look Roman? Initially the cuneiform artefacts were hidden beneath the newspapers stuffed in the larger vessels, and were not known to us. It was very clear, however, that some of the pottery samples were Roman in origin, while others were not. Question #3 - What was the significance of the index cards? The index cards seemed to refer to many of the artefacts in the collection; however, the information they provided seemed at first implausible. The notion that the majority of the collection came from Ancient Mesopotamia was unfathomable. The index card (right), states "Various Sea Shells used for holding cosmetics: Royal Cemetery Period [3500-3200] B.C." and appears to reference the sample collection of shells (left). Note the location, Ur, is not mentioned. (Click here to see a gallery of more index cards).